For decades, the IT industry has focused on ways to automate processes to increase IT productivity and efficiency and to reduce human errors. However, the focus is quickly shifting to enhance business productivity and outcomes and to provide innovation and faster speed to market. These improvements help to capture new markets and beat the competition in today’s business and technology race. Driving down cost and improving efficiency are key elements to achieve these goals because they help to free funds and resources to make strategic investments. Likewise, making sure that IT staff is focusing on innovation in the core areas of the business, continuing to work through complex problems, and improving productivity is of paramount importance. Thus, automation is becoming ever more critical. Traditional process automation relies on scripts that combine various commands that typically work only on a single platform or for specific product. Thus, traditional process automation usually involves creating multiple versions of the same thing. This type of process automation is becoming a thing of the past. Instead, solutions that use analytics-based automation, such as IBM® Enterprise IT Automation Services, are becoming the cornerstone of the next generation of enterprise IT systems. Organizations that take advantage of these technologies are seen as industry leaders. The typical IT environment of today’s enterprise includes multivendor technologies as well as various sourcing strategies and delivery models that span several platforms and products. In this modern and sophisticated IT environment, fixing operational issues, regardless of severity, becomes a challenge. Even problems caused by the simplest issues, such as password resets or a disk becoming full because of an error log file, can grow out of control or can take many hours to identify and fix. These types of events can cause outages or can severely degrade performance and can, as a result, impact the business revenue. The IBM Enterprise IT Automation Services offering from IBM Global Technology Services® (GTS) includes the dynamic automation capability. IBM Enterprise IT Automation Services identifies potential problems in IT systems and automatically fixes these problems before they become critical. IBM Enterprise IT Automation Services constantly monitors a system to keep it healthy and error free. IBM Enterprise IT Automation Services uses analytics and virtual engineering technology to identify potential problems in IT environments and automatically fix these issues before they become critical. It provides an end-to-end solution from event capturing through automation to measurement and continuous improvement. Identifies and fixes 40-45% of the incoming problem tickets, freeing IT staff to concentrate on more complex issues. Reduces the mean time to recovery (MTTR) from days and hours to minutes, preventing severity 3 and 4 events from becoming severity 1 events. Provides granular, transparent, and thorough level of details that can be analyzed to identify patterns and to provide insights to make continuous improvements in the environment. Helps with rapid resolution of incidents, combined with the scalability of virtual engineers and elimination of human errors. Is fully auditable and compliant with today’s IT security requirements. 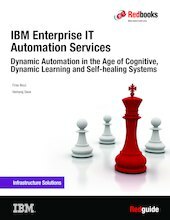 This IBM Redguide™ publication gives an IBM services perspective of automation in the era of cognitive, dynamic learning, and self-healing systems. It provides an overview of the journey that organizations go through to adopt IBM Enterprise IT Automation Services and the continual services improvement process they follow after the initial implementation.